2014 marked the launch of our most ambitious ‘Rice for Life’ campaign to date – to donate one million servings of rice to the hungry via UK foodbanks and NGOs in India and Africa. Officially launched in May 2014, our third ‘Rice for Life’ campaign involved a noticeable shift from a focus on international aid, to also recognising the need for charitable donations in the UK, in light of the growing number of families at crisis point here. The Trussell Trust, which operates the largest network of foodbanks in the UK, was one of our key distributing partners in the UK for the project, which was also backed by some of the world’s most highly regarded chefs, including Ken Hom OBE, Cyrus Todiwala OBE and Anjum Anand, as well as London Food Board chair Rosie Boycott. Thousands of servings have already been delivered to Trussell Trust foodbanks across London with further donations to follow to NGOs in India and Africa. A million servings is an incredible amount of rice. To put it into perspective, when cooked this much rice would weigh around 225 tonnes – that’s the weight of the Statue of Liberty! 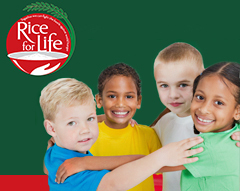 Our second ‘Rice for Life’ campaign, launched in October 2012 returned with the simple message – buy one pack, save one life. Funds raised from promotional Laila rice packs were ploughed into British Red Cross’ work in Pakistan to prevent easily treatable diseases from claiming lives needlessly. Donating 20p for every pack sold, each purchase genuinely had the power to save one life. The campaign highlighted how, what seems small change in the UK, can literally be the difference between life or death in Pakistan, with just five sachets of oral rehydration salts, costing a mere 20p, able to save the life of a child suffering from diarrhoea or one simple immunisation for a child having the ability to prevent life-threatening diseases such as tuberculosis. Our first ever Rice for Life campaign was launched in September 2011 in response to the worst floods in Pakistan’s history. The campaign raised vital funds for the British Red Cross’ relief efforts. As part of the recovery process, the British Red Cross provided people with seeds and fertiliser; enabling them to restore their financial independence, and look after their families and live with dignity. Seeds and fertiliser were identified as playing a key role in the recovery process for thousands of families which relied on agriculture as a source of income.